War Machine [Motion Picture]. Brad Pitt, Dede Gardner, Jeremy Kleiner, Ted Sarandos, and Ian Bryce (Producers) & David Michôd (Director). United States: Plan B Entertainment. War Machine is based on a 2010 Rolling Stone article “The Runaway General” and subsequent book The Operators by journalist Michael Hastings, who followed General Stanley McChrystal and his staff for several weeks in 2010. Hastings’ work is a damning portrait of a general out of touch with both the political realities of Washington and the daily struggle of the soldiers under his command. In War Machine McChrystal’s doppleganger, General McMahon, and his team are portrayed as dedicated, hard-drinking warriors earnestly dedicated to winning but without a concept of what that means to the United States or its NATO allies...to say nothing of the Afghan people. McMahon himself fully embraces the nuance of counterinsurgency doctrine, but his hard-work ethos and political naïveté cause him to lack the cold-hearted realism that would likewise tell him that his country isn’t truly behind his mission. The film is also a striking satire on the American effort in Afghanistan and the man leading it; but War Machine leaves one both in awe of its protagonist and wearily cynical of his attitudes (reflected by those in power) toward the war in Afghanistan. War Machine begins with an update of events in Afghanistan as of 2009 and the narrator could be any mid-grade officer or NCO attempting to explain the capricious turns of strategy in America’s longest war. Seemingly skeptical but objective, the narrator explains the challenges of counterinsurgency, “fighting regular people, in regular clothes…who picked up weapons because, so would you if someone invaded your country.” The unnamed narrator turns out to be a journalist accompanying GEN McMahon, the newest commander of America’s war in Afghanistan, though this twist is not revealed until late in the film. McMahon (Brad Pitt) is a cartoonish version of GEN Stanley McChrystal, whose untimely resignation is both shocking and inevitable. While the McChrystal described in “The Operators” is a real human being (some might say superhuman), McMahon has affable human traits masked by a cocked-eyed Brad Pitt. According to the narrator, McMahon is humble, but “humble in a way that says, ‘I’m better than you.’” Strangely the narrator doesn’t appear in person until the film’s third act, undercutting his initial objectivity when he is revealed to be a journalist.This portrayal is funny, but takes away from the realism needed for true satire. War Machine can’t decide what kind of movie it is. Is it satire, comedy, or dark documentary? McMahon’s biography mirrors McChrystal's, including daily 7-mile runs; but he is strangely awkward in ways unfamiliar to those who knew McChrystal, and he lacks the introspection and empathy McChrystal displayed in spades. Had War Machine been a satire in the vein of Dr. Strangelove, I would call Pitt’s performance outstanding. But in the context of the semi-realistic world of this film, it comes off as strange. Brad Pitt’s McMahon exists somewhere between the real Stanley McChrystal, George C. Scott as Patton, and Popeye. Equipped by Pitt with a cocked eyebrow, bowlegged gait, and perpetually clenched hand, McMahon is sincere, direct, and devoted. He’s also weird, detached, and constantly seems as if his attention is outside the moment. He’s comfortable only around his men, seeming aloof at best around diplomats, President Karzai, and even his wife. McMahon, a true believer, identifies that the reason American efforts in Afghanistan have failed doesn't have to do with local culture, geography, or politics. Rather, they are the result of lack of American/NATO military willpower. Believing doesn’t make it so, however, and McMahon ignores advice from diplomats, foreign officers, and locals alike. When McMahon asks Afghans what he can do to help their lives, they respond, “Please leave now.” McMahon cannot fathom that Afghans don’t want his help, and that maybe the reason Afghans attack Americans has less to do with its support for the government than simply being in Afghanistan. Yet, as awkward as Pitt’s portrayal is, War Machine is a welcome satire of America’s longest war. One of the most striking consequences of the civil-military divide is the dearth of satire directed toward the military. There was a time when the military was regarded in the same manner as government, church, or local police: something respected as important, but familiar enough to be mocked. Too often the American people—and political leaders—will do everything they can for the military, except take it seriously. We make the mistake of confusing budgets with developing cohesive strategies remotely connected with national goals. In this light (and after a decade plus of ineffectual results) the military is due for some sarcasm. McMahon is accompanied by personal staff composed mostly of military caricatures, and had his staff approached something close to real people the irony would cut deeper. There is a profane, angry intelligence officer (loosely based on Lieutenant General Michael Flynn), an out-of-shape drunkard Navy Seal, a full-bird colonel played by an inexplicably young actor, an incompetent public affairs admiral, and McMahon’s civilian advisor (Topher Grace). For example, McMahon/McChrystal’s hubris would have been forefront had we been shown, as is the case, that Topher Grace’s character invited the journalist (Michael Hastings) into their inner circle in order to show the Afghan War to an ambivalent American public. It’s a pity the film chooses to use these stereotypes to surround McMahon when realistic characters would have worked as well. Instead, War Machine exists halfway between satire and fiction, meaning it can’t capture the demands of either. Nevertheless, War Machine captures the camaraderie of a tight knit commander and staff; they love him...and he loves them, to the point of ignoring their personal foibles and the criticism-free space they created. War Machine captures the bubble that senior commanders (and other leaders) often find themselves trapped within. In McChrystal’s case, though, it was less a protective bubble than a supportive Praetorian Guard singularly dedicated to espousing the his mission. The film has a few moments that everyone who served in Iraq and Afghanistan will appreciate for the some of the absurd contra-distinctions of American policy. Observing a field of opium poppies, McMahon asks, “Can’t they grow something else?” only to hear a USAID civilian say, “Yes, cotton...but we can’t use American funds for that.” McMahon’s organizational flattening paradigm receives the perfect military acronym SNORPP (the Systematic Negation of Repetitive Procedural Practice). However, the most powerful critique of McMahon—a brutal takedown of American hubris, represented by McMahon himself—comes after McMahon delivers a succinct (and effective) illustration of counterinsurgency principles while pining for more German troops. As McMahon lectures German press and military officers, “mentioning Al-Qaeda only once” in 45 minutes, he is interrupted. A German politician (Tilda Swinton) does not question McMahon’s motives—“I believe you are a good man,” she says—but rather “his sense of self.” “You are fighting a 1,000 local battles” with people who want little more than to rid their villages of foreign soldiers. “You must know you cannot win.” McMahon is, she says, effectively deluding himself into believing he “can deliver the things [he] says,” in spite of a realistic assessment of the situation. While a call for introspection on policy is a good thing, in this film the moment is too on the nose and feels more suited for the climactic moment of a documentary. The problem with halfway mimicking real events is that the abstract satire becomes confused with a biased portrayal of real events. What if Dr. Strangelove were based on a book by George Kennan and General "Buck" Turgidson were a less-disguised version of Curtis LeMay? Satire becomes less effective with real-life noble subjects. Nevertheless, the question remains: what exactly does Afghanistan counter-Insurgency have to do with transnational terrorism? This small exchange comprises the entirety of the American effort in Afghanistan: war weary soldiers and Marines operating in a hostile environment against an unclear, vaporous enemy using a doctrine that is, historically, only marginally successfully under the best conditions. All while local nationals simply struggle to survive and the American remains ignorant as to his nation’s goals. 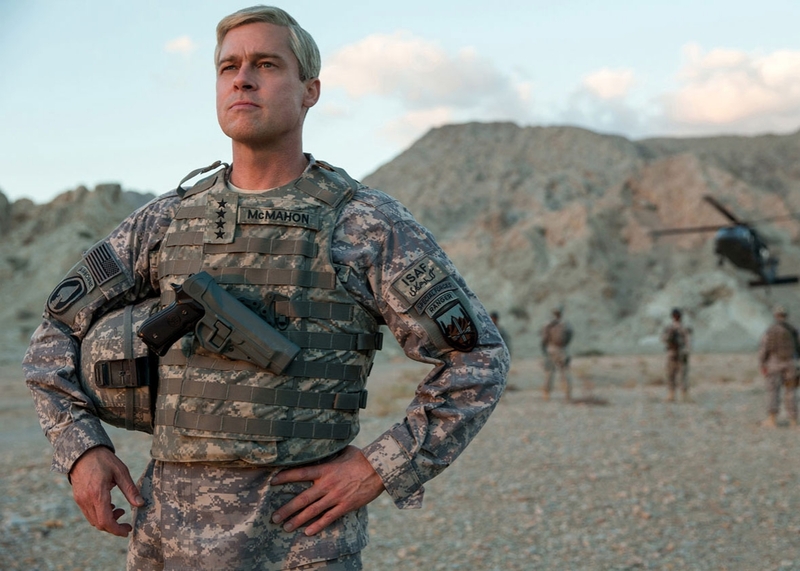 Though the film ends with McMahon/McChrystal replaced by another hard charging 4-star general determined to win the war on his terms, War Machine leaves us as the late Michael Hastings hoped. We are not consumed with the personalities and foibles that lead to one general’s ouster from Afghanistan, but the broader situation. The narrator laments that “the absence of any real soul searching” has created our Afghanistan policy. This stance has led to our seemingly permanent presence in a place we are not wanted and where we don’t want to be. Perhaps the Afghan’s advice that the best thing we can do is “leave now” is a starting point. 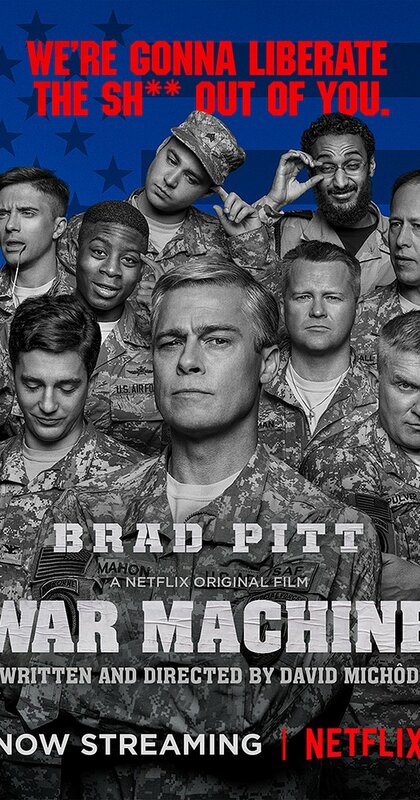 In an era when “thank you for your service” and similar bromides surround military service, War Machine is a welcome (if failed) satire that will undoubtedly become politicized by those with no skin in the game. At the same time, it will be understood (if not agreed with) by those who have served overseas. This movie brings satire back to institutions that demand it, reminding us that questioning the powers that be is not only right but necessary.